Knobby, a Sulcata (Geochelone sulcata) tortoise, so named because of his pyramiding, came in after some convincing on the part of Steve to a pet store to give him up. He not only was suffering from MBD and dehydration but also some sort of animal attack, apparently a dog. 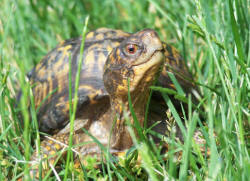 He had puncture wounds both on his carapace and plastron as well as a good portion of his carapace chewed off. Weak and very underweight at just 937 grams he was not even able to hold his own weight. His legs were splayed. He was not eating. Eventually he was convinced that a piece of butternut squash would taste good so that was his first bite of food. Of course that's not a good food for a Sulcata tortoise, but at that point it was better than nothing. By the time I got him at least he had eaten that much. 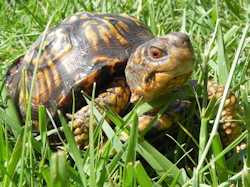 He was introduced to a good diet of Orchard grass hay which he took to rather well when mixed with a variety of nutritious greens like dandelion, chicory and turnip greens. The hay had to be cut up really small and mixed well, but eventually he developed a real liking for it and enjoyed it even without the greens. He also developed a great liking for cactus pads and cactus fruit. Knobby was loaded with pinworm so had to be treated for that. 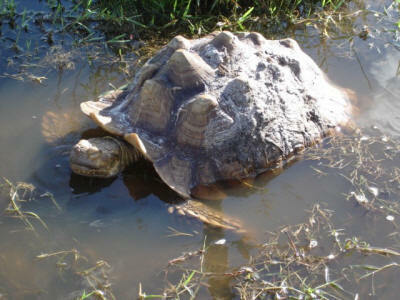 His shell was also a mess where it was chewed, with necrotic tissue that needed to be debrided daily and cleansed to keep infection from setting in. With a good diet and lots of sunshine and proper uvb lighting when indoors Knobby recovered from his injuries. It was a long slow process, but he really did well. He spent nearly two years here. He now resides in a wonderful home down in Alabama where he gets royal treatment and is growing nicely. He still has signs of his pyramids, but he doesn't look nearly as bad as he did when he first came in here. 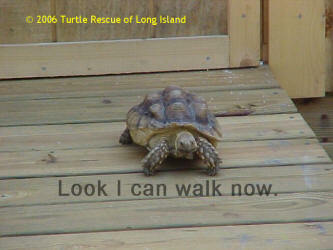 I adopted Knobby from Turtle Rescue Long Island in August, 2004. I had been looking at pictures of Knobby on the rescue organization web site and knew he had survived a very hard life up until the time he was surrendered to TRLI. Knobby had been neglected, was badly pyramided, and suffered terrible wounds from a dog attack. 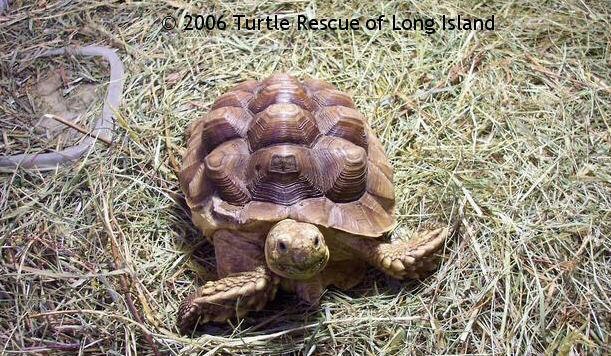 Julie had been rehabbing him for about 2 years and, under her care, Knobby grew stronger and healthier and was finally ready for adoption. 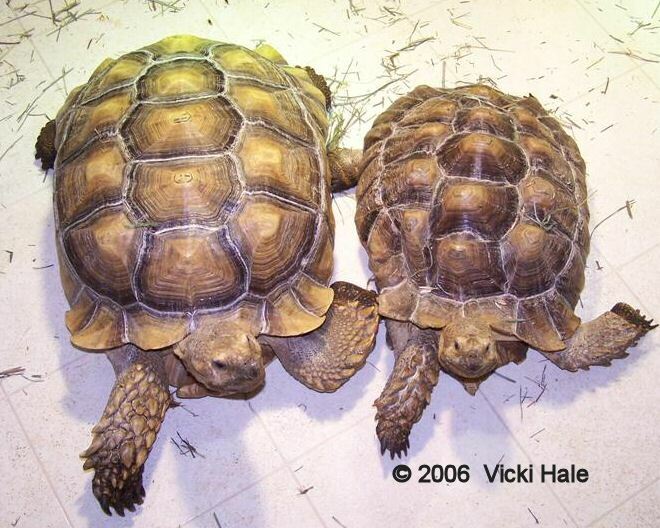 Julie’s husband drove Knobby and Mel (the second Sulcata I was adopting) all the way from Long Island to my home in Alabama; a trip that was over 2,200 miles. I could not believe the love and dedication it took to make such a long trip and will be forever grateful. Knobby is just a wonderful tort! 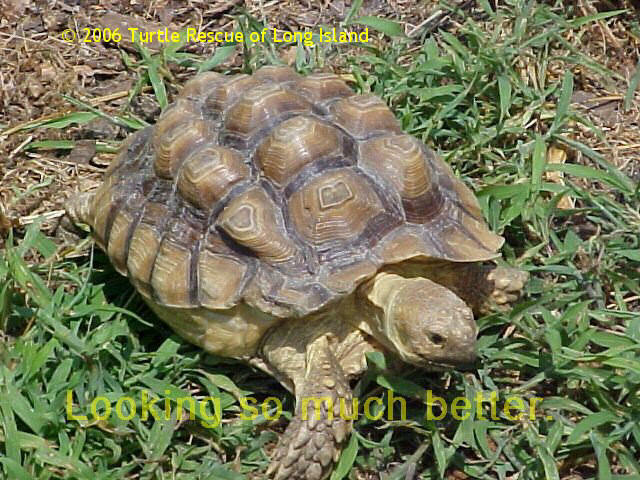 He is strong, active, healthy, and the smartest tortoise I have ever known. 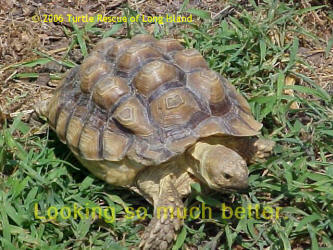 He is growing like a weed and, even though he looks a little “different”, he is all Sulcata. My thanks to Julie and Turtle Rescue Long Island for allowing me to adopt Knobby and making him a part of my family! 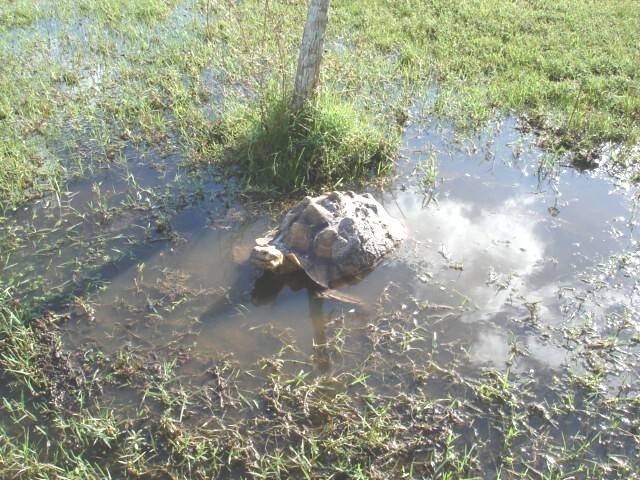 Knobby enjoying a soak !